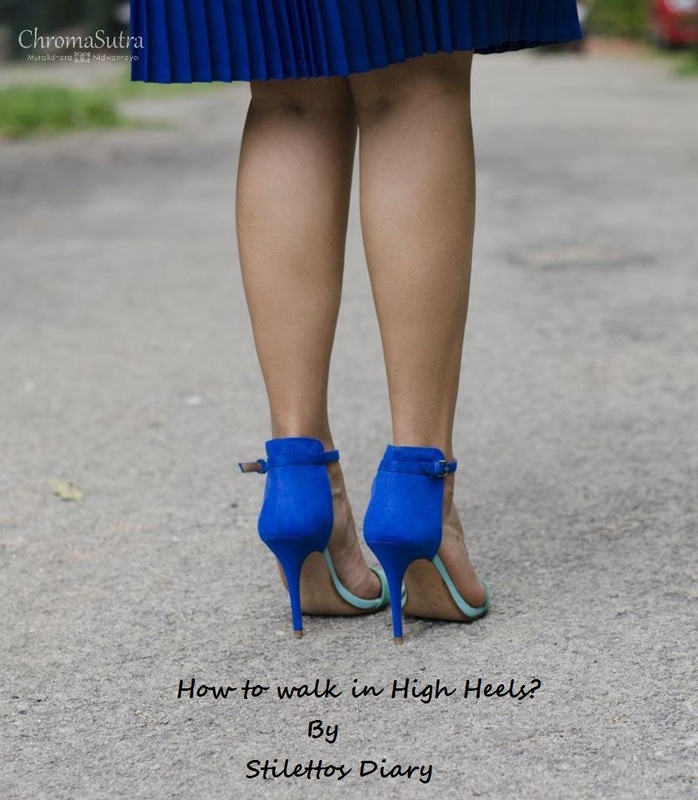 Stilettos Diary: How to Walk in High Heels? I usually get emails and messages asking how I manage to walk in high heels. I thought I will put together post that help all of you. I will focus on how to make high heels comfortable and by just becoming more aware of how you walk can be the key to learning to walk more easily and more elegantly. 1. Get right fit. It is important to get the right fit. Once you like the pair of heels walk around the store. If it is uncomfortable your feet will give signals. 2. Take the high heel test: Stand on the floor in your shoes with your knees straight, but not locked. Try to raise yourself on your toes so there's at least an inch of space under the heels. If this is not possible, your heels are too high and not appropriate for you. 3. If you are a complete new comer to walking on heels, then start first with wedge heels. Stick to wedge heels of 2 to 3 inches. Practice walking at home before taking your heels out. Get familiar with your shoes and try wearing them for 15-30 minutes at a time. Take them off, take a break and try again later. 4. After you are comfortable with wedge heels, you can move to kitten heels of 2-3 inches. Ensure that you first rest your heel and then the toe. This helps you balance yourself, provides better posture and comfortable walking strut. When you walk, make sure to keep your heels vertical. Do not roll to the side! 5. The higher your heel, the shorter your step will be. Styles with a slight platform under the toe area tend to be more comfortable and minimize the angle and pressure on the ball of the foot. 6. When walking up stairs, first land on your toe and then heels. Use the help of railings and put your entire heels on the stairs to avoid mishaps. 7. Break your heels before you use them for long hours. By long hours I mean 3 hours. Always keep a pair of flats handy to put on. If you use public transport like I do. I wear flats until I reach office and change to heels in the restroom. When I am sitting in my workstation I usually remove my heels. This reduces the stress on your back, knee and heels. 8. Walking in high heels means the smallest of pebbles, potholes, and uneven pavement can trip you up. Avoiding wearing in Indian roads and pavement. 9. Spend a few minutes giving yourself a foot massage after wearing heels. Use a tennis ball and massage under your foot in a few different directions. This not only helps loosen muscles, but can also improve the sensitivity of the sole of your foot for better balance. You can also soak your feet in hot water. It helps you overcome the stress and pain. 10. Avoid high heels if you have a lot of walking to do. When you are comfortable wearing heels, then experiment with high heels. Practice every day at your home. It will help you gain confidence. 11. I usually face problems of heels becoming lose after wearing 4-5 times. This will definitely hamper your walking. Fill in your shoes with foot cushions in the ball of the feet, this will not only help filling in gap, but make walking in heels comfortable. Fill the gap between and back of your heels with Relief strips which come on a roll like Scotch tape, but have a thick, cushion feel. Take a walk around your bedroom, feel out the exact spot where your heel is slipping out of your shoe, then stick a few inches of this stuff right there. If one piece doesn't do the trick, layer one on top of another until your heel rests comfortably against the strips. If still problem persists, the next best step would be to get a full insole to put inside your shoes. 12. Sit as much as possible. Every 20 minutes, so that you will give rest to your feet. While walking in heels ensure from your leg to spine is straight. 13. If you have to walk on slippery surface the prep our soles with grips affix to the bottom of your shoe to create some friction and provide better walking stability. Even simpler option scratch the bottom of your soles with sandpaper! 14. Walk with confidence. Don't let the fear of tumbling stop you from wearing heels. Ignore the gasps from people who think you are insane to walk in high heels. 15. Lastly, always break your heels before the big day. Take your heel for a test-drive, like shopping for grocery in supermarket. Get comfortable with them before wearing it out on any big occasions. This reduces the element of surprise and you are well prepared for the big day. P.S Hope these tips will help you. Click on the images and it will show you how I have styled each of the heels. Will be back soon with more interesting posts, collaboration and outfit posts. loved all ur heels, esp the last pink ones... love! love all of your shoes! u have great taste! xO! I didn't know wearing heel could be taught. I thought you were either born with it or not. Or maybe practice makes a man perfect (err! woman )But you are a seasoned heel-wearer and hence such a great helpful post ! Very interesting. Great post! All these high heel photos are amazing!!! !You have an amazing taste! THis is a great post. SOme wonderful tips. Thank you. Before and all i used high heels, by the doctor prescription now i am using sandles, after read your blog, i cam to know how we will use these in proper way. I like the heel shoes when I wear a short dress it is cool combination of both apparels. Thanks for the tips. I strongly agree with your points specially for simplify the language and specific: call the action.